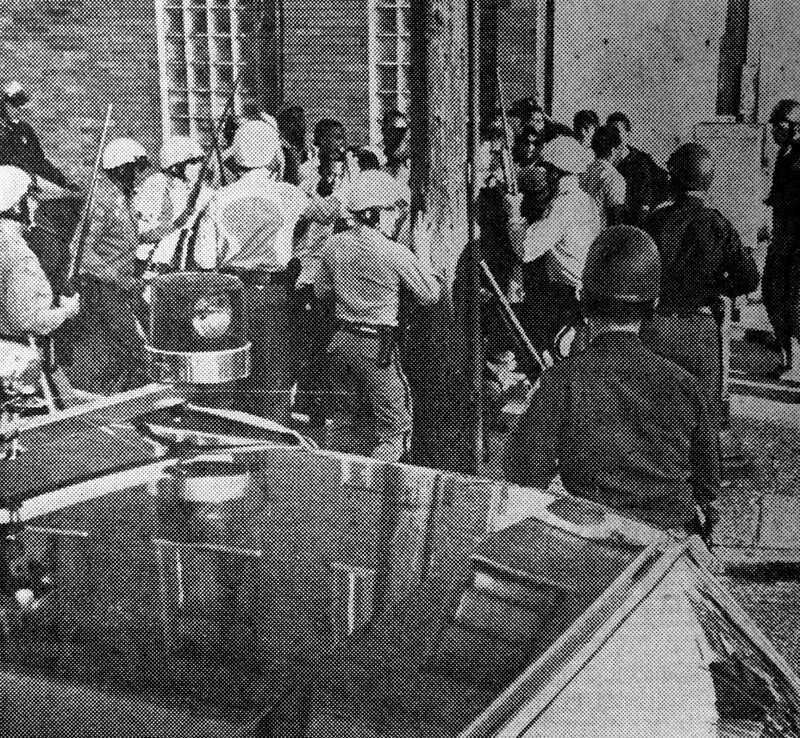 50 years after the 1967 Riot in Grand Rapids: What we know and what can we learn? On July 25th, 1967, Grand Rapids police officers arrested several Black youth, when they pulled them over believing they were in a stolen vehicle. One source says that the officers may have used excessive force in dealing with the Black youth, according to an eyewitness account. This incident was the spark that led to the 3 day riot in Grand Rapids, which lasted from July 25th – 27th. 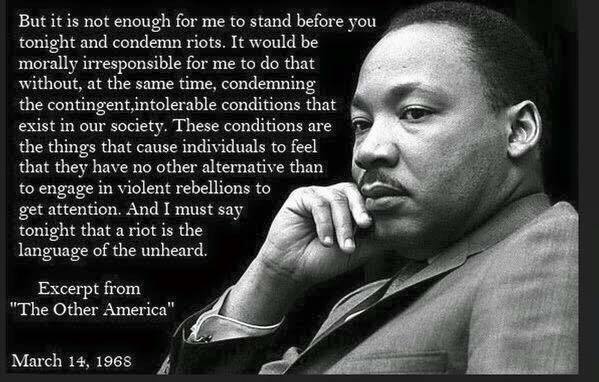 However, the riot did not occur in a vacuum. 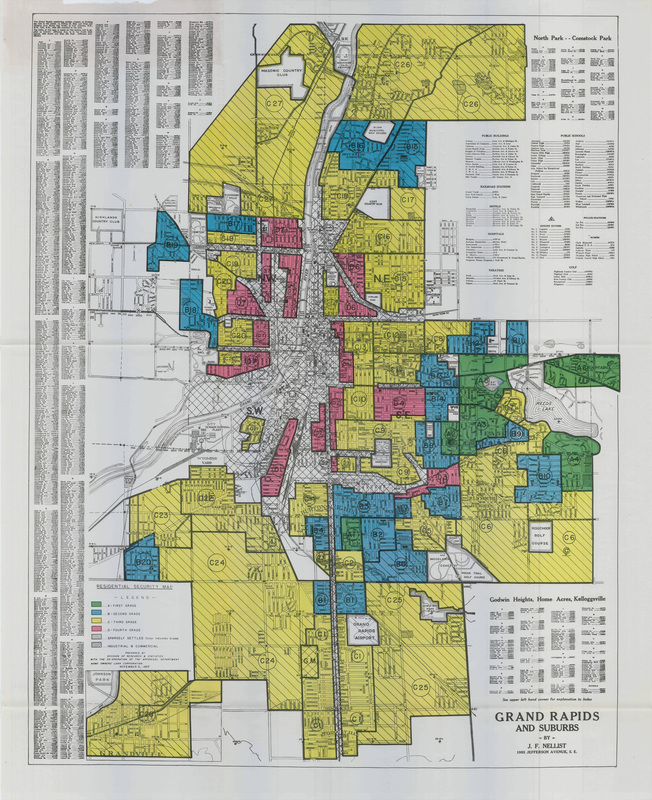 The African American community had been exploited and denied equality for decades in Grand Rapids. We know that housing segregation was systemic, with the financial red-lining of blacks and organized white resistance to blacks moving into their neighborhood. We know from reports conducted by the Grand Rapids chapter of the Urban League, that housing an unemployment conditions were appalling, based on reports from 1940 and 1947. The civil rights movement in Grand Rapids responded to these forms of white supremacy and institutionalized racism in a variety of ways. We know that blacks organized a march a week after the racist church bombing in Birmingham, Alabama in 1963, that left four blacks girls dead. Black students were also resisting institutionalized racism and school segregation in the 1960s, which culminated in what was referred to as the Mustache Affair in 1966. Thus, the riot in the summer of 1967 was just waiting to happen, considering the harsh realities that the black community was facing in Grand Rapids. We have looked at several aspects of the 1967 riot and encourage people to familiarize themselves with what happened and what we can all learn from the three-day riot. We have written about the local news coverage of the 1967 riot. 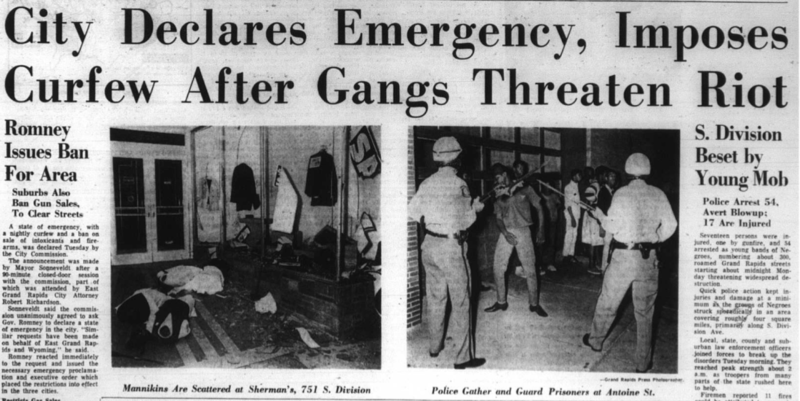 Here is a story we did 5 years ago, which looks specifically at how the Grand Rapids Press reported on the riot in 1967. We have also come across some channel 8 archival stories from the 1967 riot, with a posting of the video footage you can watch here that includes reporting from Detroit, which was rioting at the same time. In addition, we posted another story about the how the channel 8 reporting centered white voices and white perspectives and ignored black voices and the black point of view. We also have a posting that looks at some of the archival photos from the 1967 riot, photos that were taken on behalf of the Grand Rapids Press. These photos tell a certain story from a certain perspective, what we call the White Gaze. 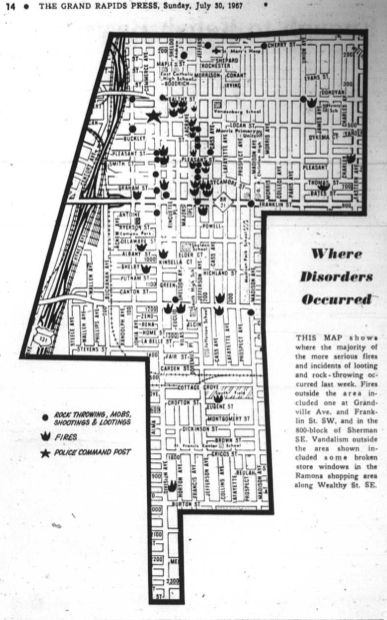 Several months after the 1967 riot, the Grand Rapids City government published a report called, Anatomy of a Riot. We posted an article that provided some analysis of the report by the City of Grand Rapids, which is very instructive, both in terms of the data and the recommendations that make up part of the report. One additional piece we wrote recently, was based upon an article that the Grand Rapids Press wrote 20 years after the riot. This article is based on the reflections of two men who were part of a federally funded task force, which used high school and college students to work in areas that were considered susceptible to rioting. The story from 1987 doesn’t provide much context for the 67 riot, but there are some useful points that are made by the two people that were interviewed. Again, we encourage people to become familiar with the history of the 1967 riot in Grand Rapids. The Grand Rapids African American Museum is hosting a photo exhibit at their downtown location and will hold an event at GVSU’s Grand Rapids campus on July 25. In addition, it is important for all of us to learn from this history and to come to terms with the systemic racism and white supremacy that continues to be deeply entrenched in Grand Rapids. We need to ask ourselves what are the similarities between the conditions for African Americans in Grand Rapids in 1967 and 2017. Are the conditions really any better 50 years later? This entry was posted in Civil Rights/Freedom Movement and tagged 1967 riot in Grand Rapids, 50th anniversary of the Grand Rapids riots. Bookmark the permalink. 2 Responses to 50 years after the 1967 Riot in Grand Rapids: What we know and what can we learn?